Triumvirat formed in 1969 in Cologne (Germany). The founding members were Hans-Jürgen Fritz, Hans Bathelt and Werner Frangenberg. They started out by performing covers of chart hits, but then got influenced by progressive rock bands like the Nice and Emerson Lake and Palmer. So much so, that they were eventually called 'The German Emerson Lake and Palmer' in their home country. Their 1979 album 'A la carte' signalled a change in direction, containing more pop-oriented songs. 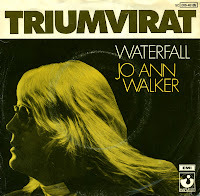 This single, 'Waterfall', was their first and only hit in the Netherlands, reaching number 37 in the Dutch Top 40.